About Manika Moulds Pvt. Ltd. Some companies focus on a futuristic vision with technical excellence and age-old values to excel them in their continued endeavors. Manika Moulds, an engineering marvel is one such establishment that was built more than a decade ago with the cohesiveness of a dedicated approach and a meticulous quest to be world-class in every way. Manika Moulds, an ISO 9001:2015 certified company accolades a strong engineering backup in plastic processing and graphs a major market share in the organized sector at a national level. 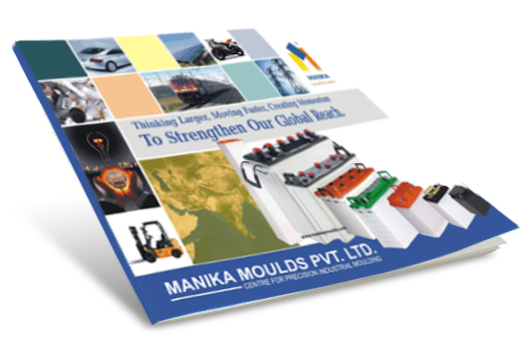 The years of commendable service and production capabilities have made Manika Moulds the pioneers in manufacturing of PP heat sealed battery containers, covers and accessories for various applications. The folio of Manika Moulds includes specialization in Injection Moulding production, with sophisticated, technologically advanced machinery and all required ancillaries. In order to achieve consistency and performance in product quality and final production, various techniques and fundamental theories such as Six Sigma is being implemented at all levels. All the MMPL plants, warehouses are connected to the Head Office in real time by ERP, SAP-R3. With an eye for perfection as well as detailed trade proficiency, Manika Moulds has been aligning its outlook and goals with changing industry temperaments. This has led the change-driven company to soar to greater heights and adapt the agility to adopt new processes and evolve manifold every passing day. With an insatiable appetite to expand as well as etch stronger impressions in the international market, Manika Moulds has commenced production in new facility of more than 18,000 Sq Mtr in Silvassa, thus catering to the scrutiny-driven requirement of its global clientele. MMPL has already spread its wings at Silvassa(UT), Dehradun(Uttaranchal), Hosur(TN). An ambitious outfit is also in the process of setting up a network of warehouses across the country to ensure speedy delivery within a recod break time. The total installed capacity is 16 million battery casing per annum with raw material processing capacity over 20,000 MT PA .It holds its own subsidiary in the name of Aquiline INC FZE, Sharjah U.A.E. to ease in the commercial activities amongst the overseas market, thus optimizing on this self-sustaining investment. Needless to say, this is just the beginning! Deep rooted and proficient in experience and age, Manika Moulds as a company thrives on its core values and principles that have redefined its existence in this competitive arena. Initiated and incorporated by Shri Nikunj Kapadia, Chairman, Manika Moulds, the company started off as a plastic processing unit, in the year 1996 to become a name to reckon with in the next decade. Since inception, MMPL had been have been involved in the manufacturing of molded furniture with some of the leading brands in the Indian market. After honing their skills with one spectrum of businesses, in the year 2002, the company diversified into injection molding of battery casings and components, a technically sound stream, which the company, due to its skilled expertise got acclimatized to with as much ease and agility.